If unraveling the mystery of your strange stranding wasn’t enough, you’ll also have to face a myriad of foes in Discover: Lands Unknown. As you traverse your new surroundings you’ll come across enemies that make this environment even more dangerous than you originally realized, and you’ll be pushed to fight if you are going to have any hope of finding a way home. Join us today as we preview combat and enemy encounters in Discover: Lands Unknown, a Unique Board Game of adventure and exploration! 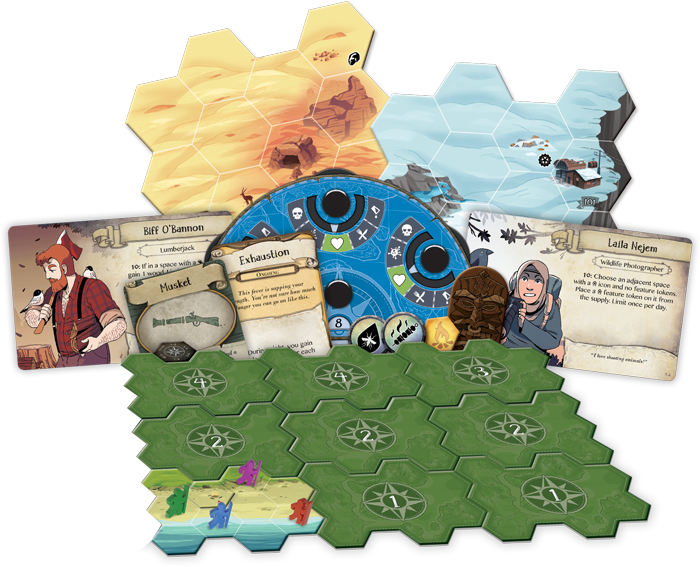 Discover: Lands Unknown is a Unique Game, meaning the mix of components found in your copy is unlike any other in the world. 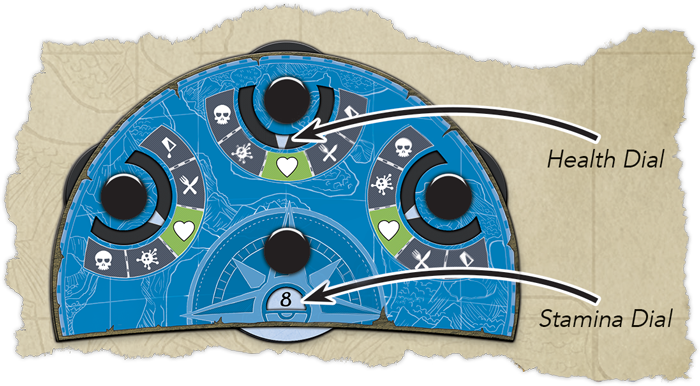 Though every game of Discover is governed by the same rules, the enemies, resources, characters, and even environments featured within will be a different combination in every box. If you would prefer to remain unspoiled on what you may encounter in your copy of Discover: Lands Unknown, turn back now! Otherwise, read on to find out how to deal with the enemies featured in your game. Enemies can appear in Discover: Lands Unknown in a number of ways. They may surprise you, disguised as a feature token in an unexplored space. What you think might be a vital source of water could turn out to be a lethal python, waiting to ambush an ill-prepared survivor. 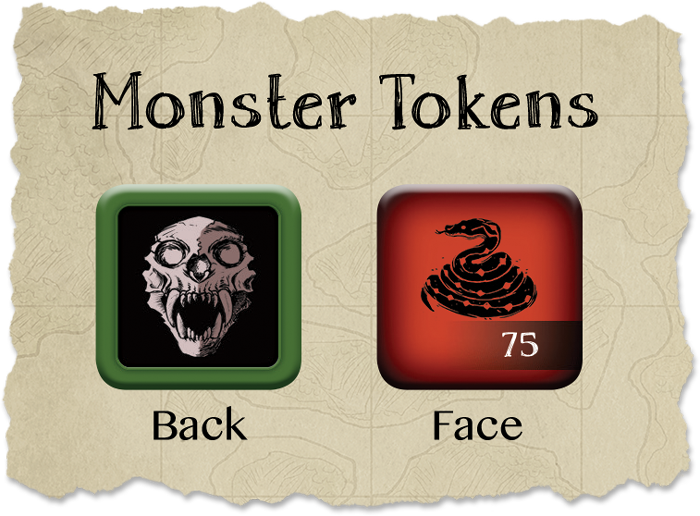 A monster token is flipped faceup when it shares a space with a survivor, instructing you to take the matching card. 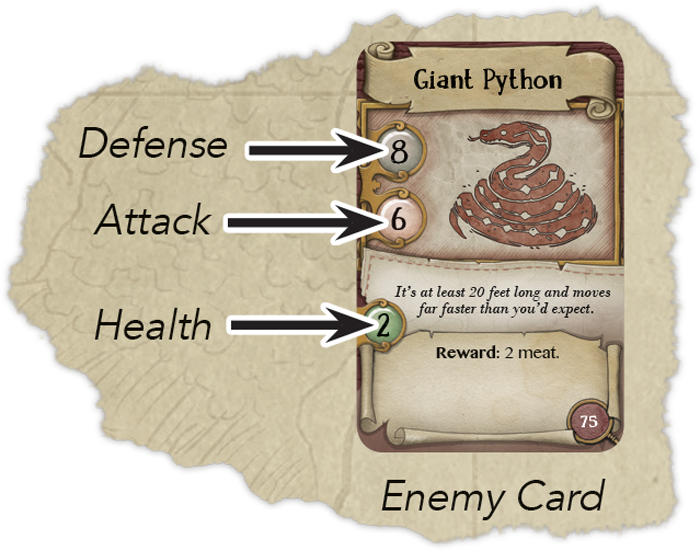 Other times, enemies will enter the field thanks to landmark or scenario cards in the form of monster tokens. These monsters are placed facedown, and card effects may move them towards survivors, so even if you’re looking to avoid combat, you still may find yourself face-to-face with a deadly monster. When you find yourself in the same space as an enemy, combat begins! Every enemy has an attack, a defense, and a health. To resolve the combat, you'll roll two twelve-sided dice, one red and one gray. If you roll equal or higher than the enemy's defense on the gray die, the enemy suffers damage. However, if the red die’s result is equal or higher than the enemy's attack, your survivor suffers damage! 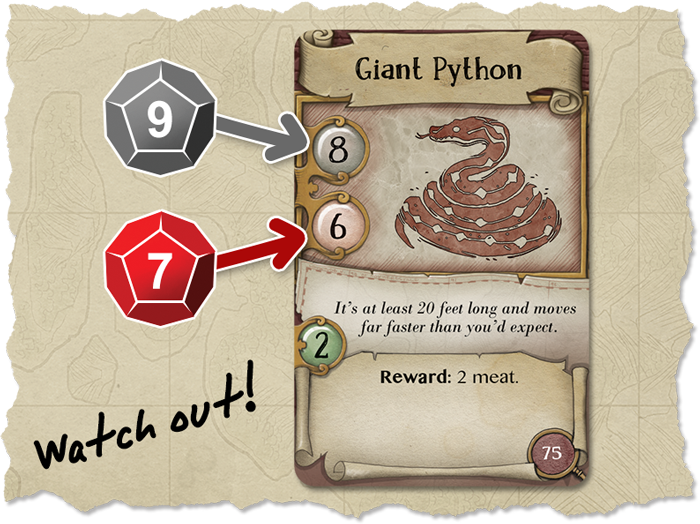 In this combat, the gray die is higher than the enemy's defense, meaning the Giant Python will take one damage. However, the red die is also higher than the monster's attack, so your survivor will also take one damage! While basic combat can be resolved quickly, your options are far from limited. Resources such as wood and stone can be used to reroll dice, nearby survivors can contribute to the fight, and rewards can be gathered for defeating enemies. However, not every enemy is aggressive, and most will try to retreat after a round of combat. If an enemy is still standing after being dealt damage, it moves to an adjacent space, based on the number showing on the red die. 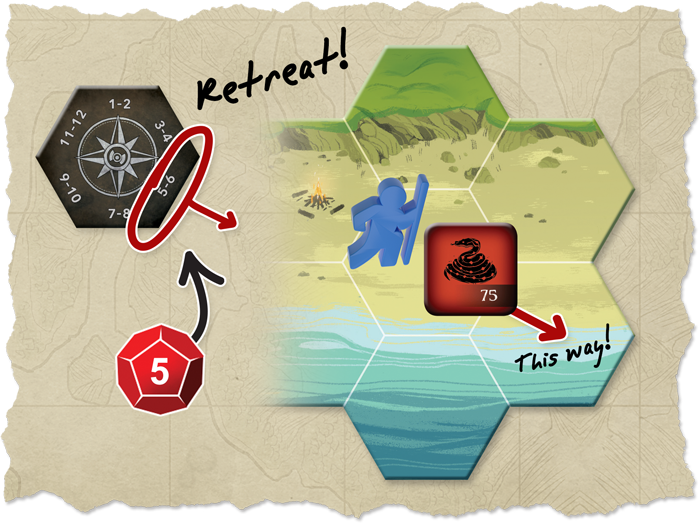 You'll compare the value on the red die to the compass token at the top of the board to determine where the enemy moves. If a survivor still wants to defeat the enemy, there’s nothing stopping you from spending stamina to track the monster down and resolve another combat—but decreasing your stamina, risking damage, and moving away from the safety of a campfire may be inadvisable. A value of five on the red die means the monster will retreat to the southeast after combat is resolved. Fighting an enemy may see you taking physical damage. Various types of damage can impede your survivor, and in extreme cases, may even lead to death. If you don’t have enough food when night comes, you may take a starvation damage. Alternatively, a lack of water may lead to dehydration damage. If a survivor takes four damage, the survivor is eliminated and loses the game. Track your health with the character tracker! If any survivor would take a fourth damage, they are eliminated from the game. While starvation and dehydration can be healed by finding food and water, physical damage inflicted by enemies will be with you forever. Engaging in combat is a dangerous endeavor, and biting off more than you can chew might mean never seeing home again! If you’re going to engage enemies, it is best to come prepared, and crafting weapons (and other key items) is one of the easiest ways to go about doing that. A survivor starts the game with a number of project cards—these project cards provide a formula for crafting a weapon or item at the cost of basic resources. For example, you may have a Bow and Arrow project card, giving you the basic blueprint for a classic weapon. This project card lets you trade three wood resources for a numbered card, which will always be the item you are crafting. A Bow and Arrow helps you fight enemies safely, but other items, like a bedroll or makeshift stove, can provide other important benefits. After you complete a project, the project card is placed faceup on the table for anyone to use, and you'll draw a new project card. Having a well-stocked inventory of crafted items can make survival easier and guide you on your adventure! As with all previews, most of the components featured today may not be found in your copy of the game. Every copy of the game will feature important items like the combat dice and compass token, but what enemies you fight and what items you can craft will be different in every copy of the game. Will you go toe-to-toe with a giant python in the forest, or tangle with polar bears in frigid mountaintops? Whatever your scenario, survival won’t be easy: do you have what it takes to find a way home? 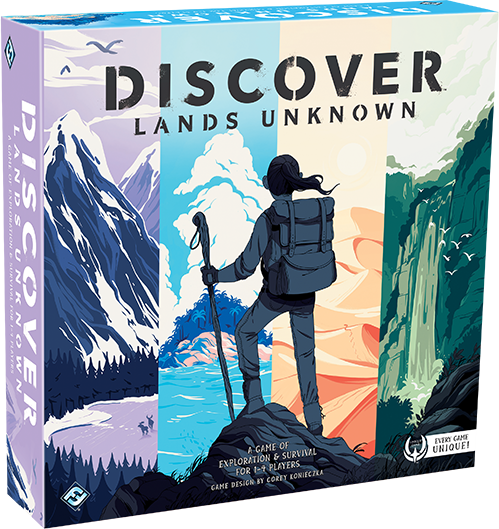 Find new adventures with Discover: Lands Unknown (DSC01), available now for pre-order from your local retailer or our website!